In November 2018, Techno Metal Post Saskatoon was hired to install helical pile foundations for five giant grain bins in Saskatchewan, for a company who specializes in the import/export of trade bulk and specialty crops. The project consisted of installing 125 P3 helical piles to support the grain bins, as well as stairs around them. When full of grain, each bin weighs approximately 650,000 lbs., so Techno Metal Post engineers doubled the number of piles for each leg and added a steel beam with reinforcing gussets across each set of two piles. The piles were installed at an average depth of 15’ to 18’ in order to reach the required torque to support a maximum load of 650,000 lbs. The steel beams and gussets were designed by Techno Metal Post’s engineering department. An 8”x10” plate was welded on top to support each leg of the grain bin. In order to make room for any final adjustments, the steel beams were welded to the 6”x 6” plate on top of each pile only after the grain bins were put in place. The soil in Cut Knife, Saskatchewan was very conducive to using helical piles as it consisted of relatively wet clay on the surface, and then a thick layer of rocks below, at a depth between 15’ and 18’. It was the weather conditions on the Canadian Prairies in November that proved to be one of the biggest challenges. 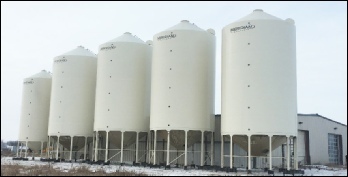 In the space of one week, the season suddenly went from fall to winter with temperatures dropping to -20 C.
That said, some of the greatest advantages of using helical piles for this project was the rapidity of installation in cold weather conditions, as well as the accuracy of measuring the required torque to support the heavy load of the grain bins. Using the EM1 installation machine, TMP Saskatoon had no problem putting in the piles. 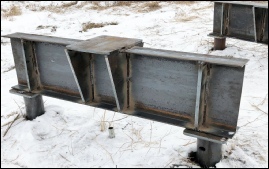 Techno Metal Post’s machinery can reach hard-to-access areas, making installation easier and more efficient – even during a Prairie winter.